This recipe is going to blow your mind on so many levels! Not only is it super flavorful and delicious, but it is so easy to prepare. This recipe is considered the ultimate ‘dump’ meal. Just place all the ingredients in the pot and walk away. 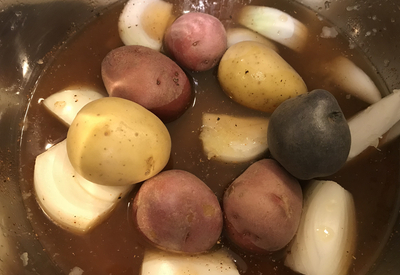 Instant Pot Low Country Boil – absolutely delicious!!! 35 minutes later, open the pot and dinner is served! It’s that easy!!! Low Country Boil is a dish that originated in lower South Carolina. It was the answer to New England’s clam bake and Louisiana’s Seafood boil. The whole concept revolves about using local food and throwing it in a pot to cook together. 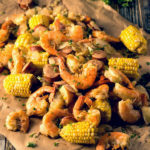 Low Country Boil traditionally uses fresh caught shellfish, corn on the cob, spicy sausage and potatoes mixed with Cajun spices and boiled in a large pot. To serve this at a large gathering, it is spread on top of newspaper in the center of the table and eaten with your hands. Leave the baby potatoes whole so they are perfectly cooked. Instant Pot Low Country Boil takes all of the flavor a traditional boil and makes it in the fraction of the time! In order for this to be a true dump meal, you must use frozen corn on the cob and frozen shrimp. If you use all fresh products, there are separate cook times for the various ingredients. I find it easier and more user-friendly to load everything in the pot at once and everything is ready at the same time. You can freeze your own corn on the cob when it is in season. And for the shrimp, I prefer to buy it frozen where I live because it is the only way I can get wild-caught shrimp. For a more authentic experience, buy shrimp that is deveined but still has the shell attached. Traditionally, the shells of the shrimp are left on while cooking. Not only does it give a more authentic look to a rustic dish, but the shells also add flavor during the cooking process. But sometimes, out of pure laziness, I use already peeled shrimp. Either way you will want to make sure that the shrimp you use is deveined. The vein on the back side of the shrimp really isn’t a vein at all. It’s the digestive tract and is full of the breakdown of whatever the shrimp ate. If you don’t remove it, the shrimp will have a gritty taste that will take away from the shrimp’s delicate taste. 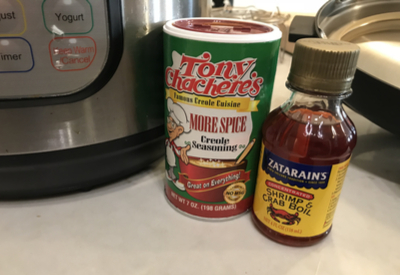 Zatarain’s Shrimp & Crab Boil liquid and Tony Chachere’s Creole Seasoning flavor this dish perfectly! To add additional flavor to this dish, I use a tablespoon of concentrated Zatarain’s Shrimp & Crab Boil liquid. It isn’t necessary, but it adds so much extra flavor to this dish. And since we like things spicy in our house, Tony Chachere’s More Spice Creole Seasoning is used. However you could use standard creole seasoning or even Old Bay’s Seasoning for this recipe. 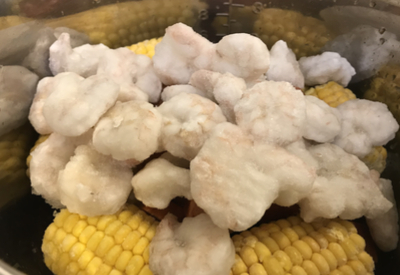 However you choose to make your Instant Pot Low Country Boil, I am sure you will love it as much as we do! 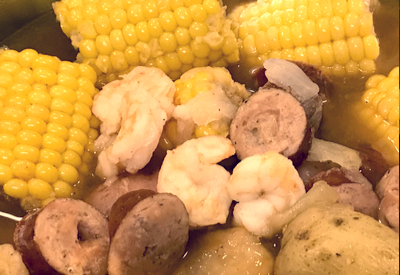 Shrimp, corn on the cob, sausage and potatoes flavored with creole seasoning that can be served traditional style on the middle of the table or on a plate. Add broth, crab & shrimp boil, creole seasoning, red pepper flakes, salt, and pepper into the Instant Pot and stir. Next add the onion, still in chunks, and the minced garlic. Layer the potatoes on top and around the onions. Next add frozen corn on the cob pieces around the outer layer of the pot. Add chunks of sausage in the center of the corn on the cob. Add frozen shrimp on top. Place the lid in the sealing position and Pressure Cook on High pressure for 0 minutes. Set a timer for 35 minutes. Once the timer goes off, hit the cancel button and quick release any remaining pressure. The pot may not have come to full pressure, however, your food will be cooked perfectly. ← Dairy-Free Queso Dip – Vegan Cheese Dip Made In Minutes!